I think I owe The Body Shop an apology, as in the rush of holiday products and sets, I totally forgot about them. Until last week when a pretty sizeable box of their holiday offerings arrived, that is. The Body Shop does the holidays up pretty well as they've always got an assortment of festive gift sets, and options for every price point. This year they've one upped that, as specially selected gifts (winch is almost all of them) also provide a family in Ethiopia with clean water for a day. A nice touch, I say. Read on for a little rundown of what's available. Like the Frosted Plum Bath Fizzers. The cubes are tossed into the tube for a fizzy, fragrant bath experience. The Frost Plum variety includes real plum extract and a scent that combines fresh plum, magnolia, and peony. A fragrant home is made that much simpler with the Glazed Apple Home Fragrance Oil. Simply add a few drops into an oil burner, light your tea light and enjoy the candied green apple scent. For a tangy-sweet shower (or bath) the Frosted Cranberry Soap is for you. The scent is perfect and you get a nice cleanse and lather from the glycerin based bar. The Moringa Treats Gift Cube contains a mini Moringa Shower Gel (60 ml) and Moringa Body Milk (60 ml) with a mini Bath Lilly. The little cube makes a great stocking stuffer or emergency gift for those 'need a gift quick' moments. For the body butter lovers on your list, the Fruity Body Butter Sweetheart is a no brainer. 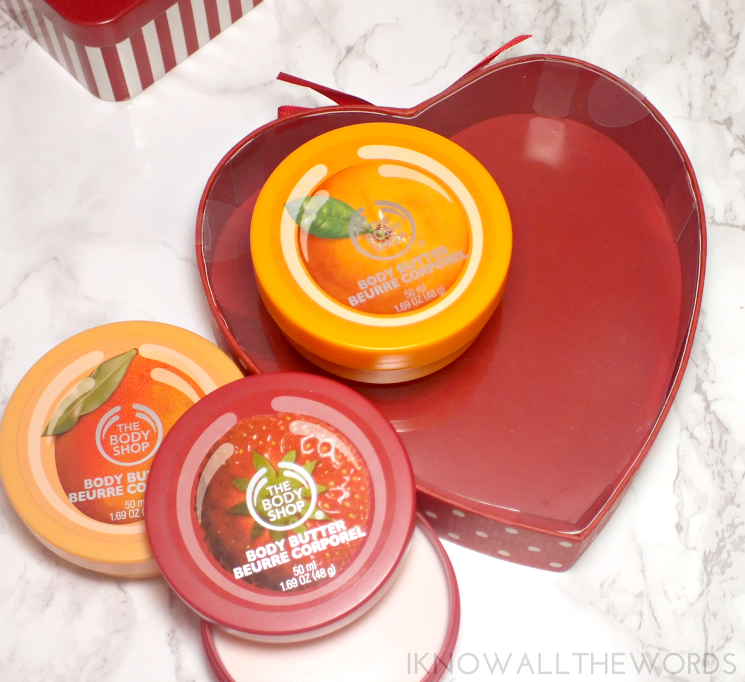 The polka dot heart shaped box contains three mini-size body butters in Strawberry, Mango, and Satsuma (50 ml) This seems to gone from the Body Shop site, but it should be available in stores. Get to the mall! The boys are quite often forgotten when it comes to bath & body sets, but the Body Shop has you covered. 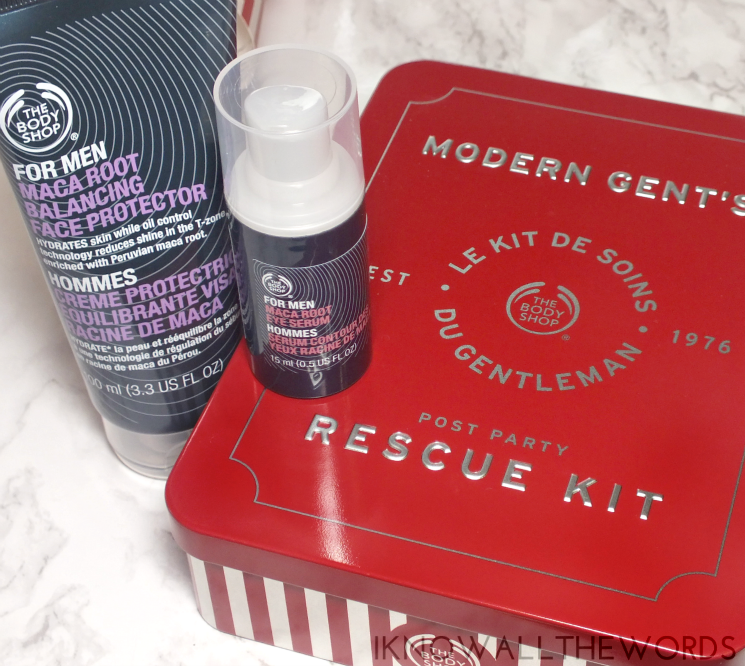 The Modern Gents Post Party Rescue Kit contains a tube of Maca Root Balancing Face Protector (100 ml) and Maca Root Eye Serum (15 ml) housed in a vintage style tin. The duo work get skin back into fighting form after a night of a few too many refreshments, with the protector working to hydrate and reduce oil and the serum works to hydrate and energize. 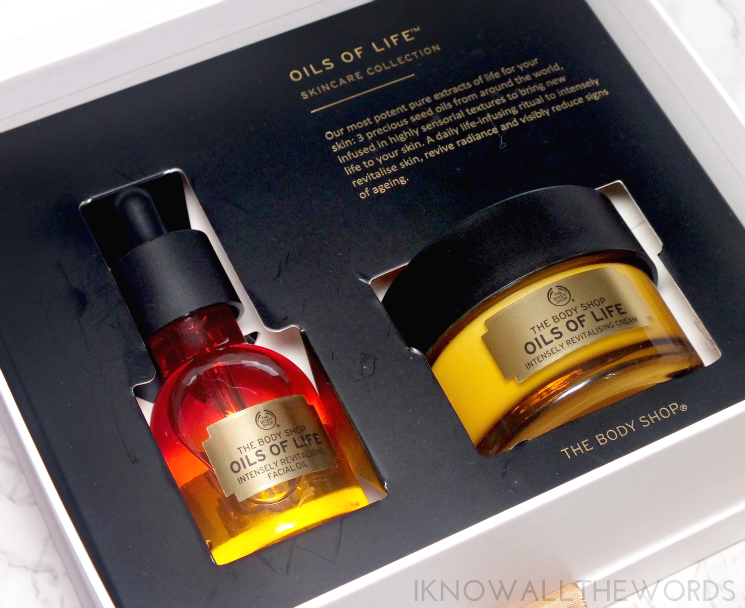 Getting into the more impressive gift sets, the Oils of Life Skincare Collection combines the Oils of Life Intensely Revitalizing Facial Oil (30 ml) and Oils of Life Intensely Revitalizing Cream (50 ml) housed in a sleek white gift box tied with a gold ribbon. Both products are full size (you save $13 CAD buying the set as opposed to buying them separately) and combine three precious oils from around the world. Black Cumin seed oil from Egypt, Camellia seed oil from China and Rosehip seed oil from Chile, which are known for their revitalizing an repairing properties. This luxe (but not budget-busting) gift is perfect for any skincare lovers on your list, but I suggest buying two. You're going to want one too! Last up, a selection of classic Body Shop products in the form of the Coconut Premium Selection. Housed in a sizeable brown box, and silky red bow, the coconut lover in your life will receive Shower Cream (250 ml), Body Butter (200 ml), Cream Body Scrub (50 ml), Body Mist (100 ml), and Hand Cream (30 ml). Not a fan of coconut? No problem! There are a few ofter scent options including Fuji Green Tea, Honey Mania, Strawberry, Mango, Olive... You get the idea. 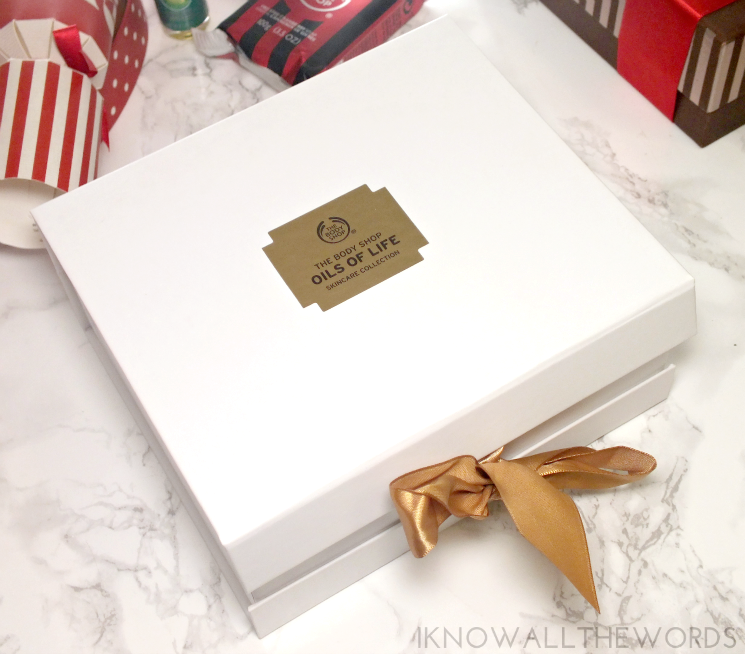 Overall, a bunch of great gifting options from The Body Shop this year. I love that they've included a mix of new products and scents with the classics everyone knows and loves. 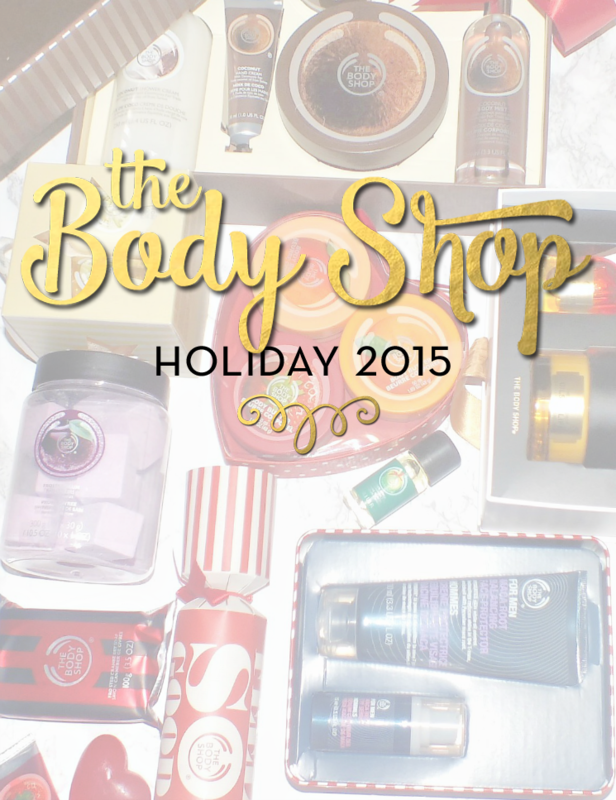 Will you be giving any Body Shop gifts this year? Anything here you'd like to see under the tree?